Mexican food has become a staple in American cuisine. We have a great way of taking the foods of other cultures around the world, adopting them as our own and then adapting it to our local traditions and flavors. Now we make tacos and burritos using ingredients not commonly part of Mexican cuisine. A great example is the seasonal Fall Thanksgiving burrito. 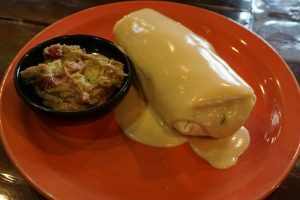 Mexican restaurants wanting to push the boundaries and offer something different and exciting serve every Fall a burrito stuffed with Thanksgiving favorites. This week, I got the opportunity to try out the some new Fall menu items at Steel Cactus. So I’ll start this off with I don’t go to Steel Cactus very often. I’m not usually near there restaurants very often. Every time I do eat at Steel Cactus, the food is consistent and the margaritas have a good helping of tequila. The tequila part is important. I was definitely willing to give them a try when creating something new. 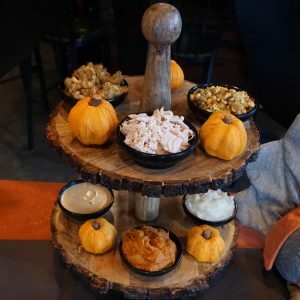 The Fall menu item is Thanksgiving themed. I love Thanksgiving only because I get an excuse to cook a turkey, show off how great I am in a kitchen and an unhealthy amount of food for many days. 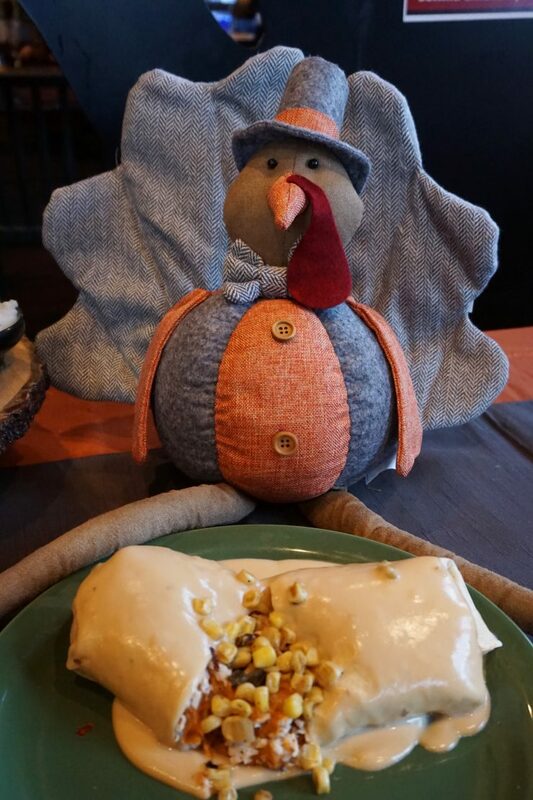 Steel Cactus is introducing a Thanksgiving dinner burrito called The Bird. 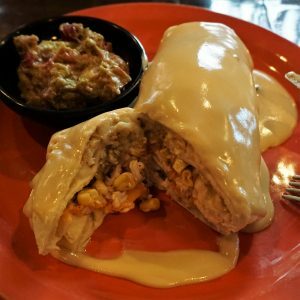 You might be thinking, there is another restaurant in the area already doing a rather well known Thanksgiving burrito. However, Steel Cactus is actually offering something different enough to make it interesting. Their burrito is made with most of the usual Thanksgiving dinner regulars like turkey, mashed potatoes and stuffing. The changes they make to the Thanksgiving regulars that really give the burrito a unique flavor. Inside the burrito, Steel Cactus also includes a mashed sweet potato spread, which tastes a lot like a sweet potato casserole, and a corn salsa instead of plain corn. 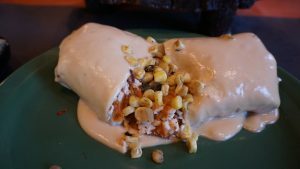 On the outside, the burrito is covered in a queso gravy, giving it a creamier flavor instead of usual salty savory gravy found at Thanksgiving. These are what really make this burrito stand out as different. My only complaint is they need to work on their burrito rolling. All my stuffing was on one side of the burrito and mashed potatoes on the other. The different flavors need to be spread throughout the burrito. The flavors of the stuffing and sweet potato do manage to stand out on their own. They served the burrito with a side of cranberry guacamole. The cranberries give the guac a good tart flavor, but probably needed a little bit of spice to give it the kick expected of some Mexican food. I’d have Steel Cactus give me The Bird again especially in the weeks leading up to Thanksgiving and I’m not ready to make my own Turkey yet. Accompanying my meal was the seasonal drink, the Rusty Musket. I don’t get many sweet liquor drinks. I usually drink lots of dark beers and bourbon, rye whiskey and scotch. 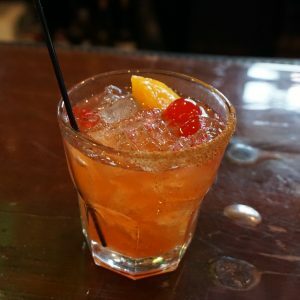 Steel Cactus made for the fall a tequila drink mixed with a house made cinnamon simple syrup, maraschino cherry and orange, with the glass rim coated in cinnamon sugar. This was great. I had two and left with a good buzz. It was similar to a Manhattan, but with tequila. I felt it tasted a lot like cranberry sauce. Order it if you are of legal age, love sweet drinks and like cranberry sauce that might get you a little drunk. I also tried their Agave Lime Wheat beer. It was very light on the palette and refreshing. Steel Cactus has three locations in the city of Pittsburgh in Southside, Shadyside and at PNC Park.